periences of learners and their significant others to develop resources that engage and support. The stories are authentic and tell of each students’ journey…Nona’s story resonates with those who are migrants. When I read her story it reminded me of my late grandmother who did not complete primary education but had an insight into what she could do to support me. Nona’s joy of seeing her grandson study at university and how she supports him, is very heart warming and her advice is practical (Wolfgramm-Foliaki, 2017). 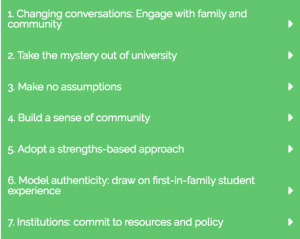 The site is underpinned by a strengths-based philosophy (Anderson, 2000, O’Shea, May, Stone & Delahunty, 2017) that seeks to assist students and their family members to actualise existing skills and knowledges with the HE environment. Overall, the site seeks to celebrate the achievements of students rather than focus on barriers or limitations. This website resource has attracted widespread attention, with requests for site-links from other HE institutions, schools and the VET sector, as well as being identified as Best Practice in Student Support (Australian & New Zealand Student Services Association, 2015). 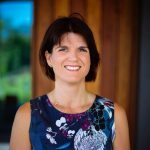 especially since receiving her Australian Government National Teaching Fellowship in 2015. This Fellowship built upon her previous work with first-in-family students and worked with institutions to explore best practice in retaining this cohort. The Fellowship developed a range of online resources designed to engage both the students and their families in this transition to university. 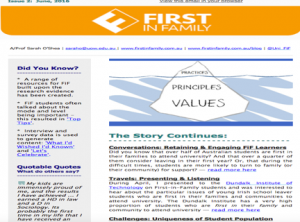 Additionally, Sarah collaborated with outreach practitioners and equity stakeholders (n= 330) to develop the Principles and Strategies for Supporting First-In-Family Students and their Families. Since 2015, Sarah has also presented workshops to over 500 staff across 15 university sites in all states of Australia (except NT). These workshops have focused on supporting and engaging students who are first in their families to come to university. This work has been well received: 239 participants completed workshop evaluations with some 86% indicating that they were likely or most likely to apply ideas derived from the workshop to their professional context. The majority of attendees (89%) rated the workshop activity to be outstanding or above average, with 97% of respondents (n=227) strongly agreeing/agreeing with the statement ‘The information presented has increased my knowledge in this area [i.e. supporting and engaging FiF students]’. The Fellowship outputs were also disseminated via a FiF blog (http://www.firstinfamily.com.au/blog/), complemented by an online newsletter via email. The impact of this Fellowship was further consolidated when Sarah was invited to work with several institutions to develop online tools and also provide capability building, mentoring and advice around strategies that might be implemented to support this first in family cohort within their own university context. This perhaps is one of the most rewarding aspects of a National Teaching Fellowship being able to not only initiate change but also witness the influence this work can have at both a local and practical level. Sarah’s work also has international appeal and in 2017, she was awarded an ARC Discovery project to explore the persistence behaviours of first-in-family students in the latter stages of their degree programs. This study is collecting data in nine universities across Australia, the UK and Ireland and will develop the first capabilities–informed framework to inform approaches to university student retention. The international appeal of this research is also demonstrated through publications, which include two recent books (O’Shea et al, 2017 ; Harwood, Hickey-Moody, McMahon & O’Shea, 2017), both deeply explore the perceptions and understandings of HE participation amongst students who are traditionally under-represented in this sector. Sarah also deliberately seeks out other forms of dissemination that reach practitioners working in the field, this has included online open access sources (here and here) as well as open access journals with international reach. Harwood, V., Hickey Moody, A., McMahon, S., & O’Shea, S., (2017). The Politics of Widening Participation: Making Educational Futures. Oxford: Routledge. Site analytics indicate 14,000 individual visitors since the site went live in April 2015, most visitors view more than one page (n= 32,803 page views) and about one in five are repeat visits.